Solar wind flowing from this coronal hole is buffeting Earth's magnetic field. Credit: SDO/AIA. SOLAR ACTIVITY INTENSIFIES: Huge sunspot AR1476 is crackling with M-class solar flares and appears to be on the verge of producing something even stronger. 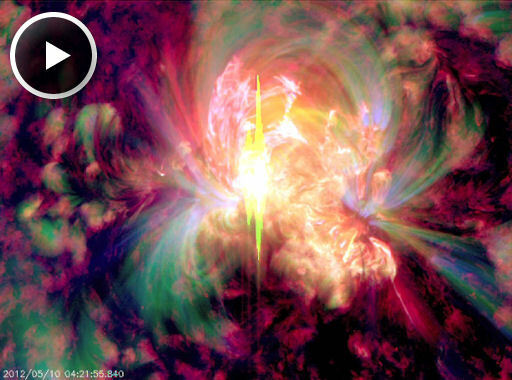 The sunspot's 'beta-gamma-delta' magnetic field harbors energy for X-class flares, the most powerful kind. Earth is entering the line of fire as the sunspot rotates across the face of the sun. Apparently, the almost-X class explosion did not hurl a significant CME toward Earth. NOAA forecasters estimate a 65% chance of more M-class flares and a 10% chance of X-flares during the next 24 hours. X-flare alerts: text, phone. "The strongest burst so far occured around 1631 UT on May 9th," reports Ashcraft. "I am observing at 28 MHz and 21.1 MHz. As I send this note I am hearing more bursting, indicating powerful magnetic dynamism within active region 1476." Solar radio bursts are caused by plasma instabilities that ripple through the sun's atmosphere in the aftermath of powerful flares. 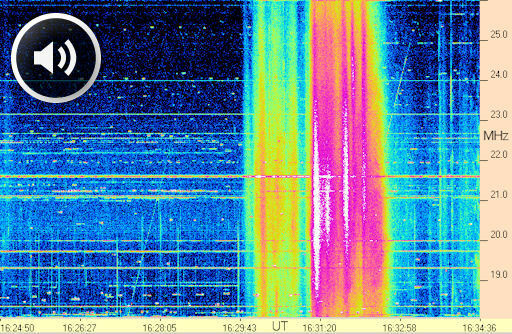 With AR1476 poised for more eruptions, this 'radio activity' is likely to continue for days. Stay tuned. 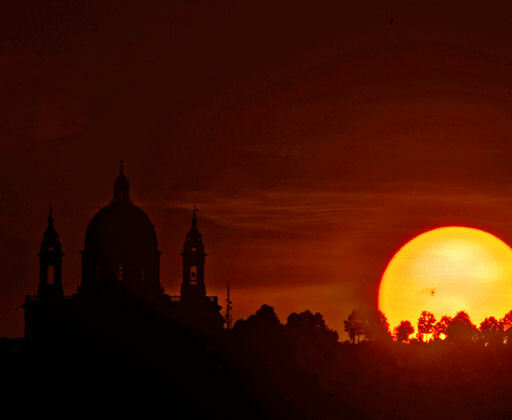 "This morning the sight of the majestic sunspot AR 1476 was great as the sun was rising alongside the Basilica of Superga!" says De Rosa. The sunspot looks a lot like Hawaii, but it is much bigger than any island on Earth. From end to end the sprawling active region stretches ~160,000 km, or a dozen times wider than our entire planet. If you have a sunspot telescope, take a look. The view is magnificent. Caution: Even when the sun is dimmed by clouds and haze, looking into the glare can damage your eyes. Looking through unfiltered optics is even worse. If you chose to photograph the low sun with a digital camera, please use the camera's LCD screen for pointing. Do not peer through the optical viewfinder. On May 10, 2012 there were 1287 potentially hazardous asteroids.